From the weddings of Jacqueline Kennedy to Queen Elizabeth, the classic and simple string of white pearls will make your wedding ensemble perfect. These are round Japanese cultured pearls, 6 to 6.5 mm in diameter with excellent color and luster. 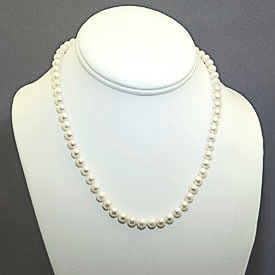 This simple pearl necklace will stay with you throughout your life, and can be worn with everything from the little black dress to fancy evening gowns. This necklace is 18" in length and has a 14K yellow gold filigree clasp and is delivered in a white leatherette porfolio well suited for gifting. See the matching earrings here.